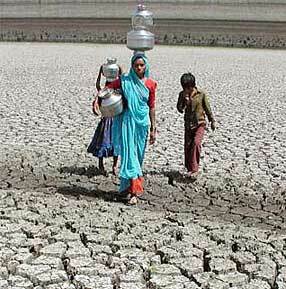 Accompanied by her children, a woman treks across a dried-out lake in search of water in the western Indian state of Gujarat. On the banks of the holy Narmada river, farming families have lived for centuries — illiterate and using traditional herbal medicines, but self-supporting in small village communities. One young village healer, Luhariya Shonkariya, now faces an impossible choice: “Government officials came here. They said they are constructing a dam and water will come. ‘So your village will be drowned.’ Our village is ours. We won’t leave.” The Sardar Sarovar dam, a keystone in the Indian government’s development plans, has been rising in the Narmada Valley for decades. Recently work on this dam — one of the world’s largest — has reached the point where dozens of villages are being submerged by the rising reservoir, forcing their inhabitants to flee or drown. Proponents of the dam argue that while it will displace more than 300,000 people, it will provide electricity, irrigation, flood control, and drinking water to an estimated 40 million. Critics maintain that the benefits could have been achieved in other ways, with far less human cost. Wide Angle reports on the decision Luhariya and his family have made — to stay put and face drowning in the rising waters. “The Dammed” raises important questions about the costs and consequences of modernization and development, as the global community re-evaluates the social and environmental impacts of large dam projects.